Investigators work at the site of an explosion at the entrance to a train station in Volgograd December 29, 2013. A suicide bomber blew herself up in the entrance hall of a Russian train station today, killing 16 people in the second deadly attack within three days as the country prepares to host the Winter Olympics. 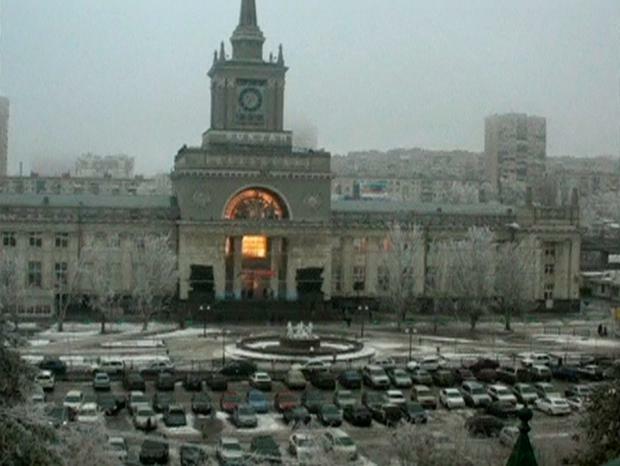 The bomber detonated her explosives in front of a metal detector just inside the main entrance of Volgograd station. Footage shown on TV showed a massive orange fireball filling the stately colonnaded hall and smoke billowing out through shattered windows. "People were lying on the ground, screaming and calling for help," a witness, Alexander Koblyakov, told Rossiya-24 TV. "I helped carry out a police officer whose head and face were covered in blood. He couldn't speak." A spokesman for Russian investigators said at least 14 people were killed. The regional governor put the toll at 15. President Vladimir Putin ordered law enforcement agencies to take all necessary precautions to ensure security, his spokesman said. A federal police spokesman said measures would be tightened at stations and airports, with more officers on duty and stricter security checks. But the attack, just over two months after a female suicide bomber killed six people on a bus in the same city, raised questions about the effectiveness of security measures which the Kremlin routinely orders to be increased after bombings. It could add to concerns about the government's ability to safeguard the 2014 Winter Olympics in the Black Sea resort of Sochi. The Games, which open in 40 days' time, are a major prestige project for Putin, who wants to show how far Russia has come since the Soviet Union collapsed in 1991. There was no immediate claim of responsibility for the attack. Female suicide bombers - known as 'black widows' because some are the relatives of dead insurgents - have carried out several attacks claimed by Islamist militants. Volgograd lies just above Russia's restive North Caucasus region, a string of mostly Muslim provinces that includes Chechnya, where Russia has fought two wars against separatists in the past two decades. The region is beset by near-daily violence. Interfax news agency cited a law enforcement source as saying the attacker may have come from Dagestan, the province adjacent to Chechnya that is now the centre of the insurgency. The October bus bomber was from the same region. Volgograd is a city of around 1 million people, and a major transport hub in southern Russia, about 430 miles (690 km) northeast of Sochi, where the Olympics will open on Feb. 7. Insurgent leader Doku Umarov, a Chechen warlord, urged militants in a video posted online in July to use "maximum force" to prevent Putin staging the Olympics. On Friday, a car bomb killed three people in Pyatigorsk, close to the North Caucasus and 270 km (170 miles) east of Sochi. "We can expect more such attacks," said Alexei Filatov, deputy head of the veterans' association of the elite Alfa anti-terrorism unit. "The threat is greatest now because it is when terrorists can make the biggest impression," he told Reuters. "The security measures were beefed up long ago around Sochi, so terrorists will strike instead in these nearby cities like Volgograd." Volgograd is one of the venues for the 2018 soccer World Cup, another high-profile sports event Putin has helped Russia win the right to stage, and which will bring thousands of foreign fans to cities around Russia. Today's attack was the deadliest to strike Russia's heartland since January 2011, when a male suicide bomber from the North Caucasus killed 37 people in the arrivals hall of a busy Moscow airport. Health Ministry spokesman Oleg Salagai said 42 people were wounded and that some would be flown to Moscow for treatment. Authorities said the woman detonated her explosives after police noticed she looked suspicious and one began to approach her. They said the toll could have been much higher if she had made it into the station waiting hall. But Filatov said that the widespread practice of placing metal detectors at the entrance of airports and stations risked causing more casualties: "We are creating this danger ourselves by allowing a place for a crowd to gather." The Investigative Committee said the bomb detonated with a force equivalent to at least 10 kg (22 lb) of TNT. A human head believed to be that of the bomber was found at the scene, Interfax cited a law enforcement source as saying. Life News, a Russian website with ties to security agencies, showed graphic photographs of the head, with half the face visible and a tangle of long, matted hair. The Volgograd station - a Stalinesque architectural monument with a clocktower, spire and martial statues flanking the central entrance where the attack took place - was busier than usual, with people travelling home for the New Year holidays.